For this blog post I’ve used a Docker container running an Oracle Database 18c version 18.2.0.0.180417 on my MacBook Pro (Late 2016). The initialization parameter _exadata_feature_on=TRUE enabled technically the MemOptimized RowStore. This means that I expect the feature to work but with different performance metrics as on one of the officially supported environments. This is a dedicated buffer cache for table blocks. 75% of the memoptimized pool are reserved for this buffer cache. A hash index is a hash table/map as we know it from Java and other programming languages (associative array in PL/SQL). The primary key columns are used as key and a pointer to the block in the memoptimize buffer area is used as value. The hash index uses the other 25% of the memoptimized pool. The size of the memoptimized pool is set by the initialization parameter MEMOPTIMIZE_POOL_SIZE. The default size is 0. Changing the value requires to restart the database. The minimum size is 100M. The table is marked as MEMOPTIMIZE FOR READ. See the memoptimize_read_clause for CREATE TABLE and ALTER TABLE statements. The table has a primary key. The primary key is not an identity column. The table is not compressed. The table is not reference-partitioned. The table has at least one segment (use SEGMENT CREATION IMMEDIATE when creating tables). The table has been loaded in the memoptimized pool using dbms_memoptimize.populate. The table fits completely in the memoptimized pool. The query must be in the format SELECT <column_list> FROM <table> WHERE <primary_key_column> = <value>. The result columns must derive from the underlying table. Multiple primary key columns are supported, in this case all primary key columns have to be defined in the where_clause. Additional predicates are not allowed. The initialization parameter STATISTICS_LEVEL must not be set to ALL. The optimizer hint GATHER_PLAN_STATISTICS must not be used. SQL trace must not be enabled. The query must not be executed within PL/SQL (neither static nor dynamic SQL are supported). The query must not be executed using the default database connection in a Java stored procedure. The query must not be executed from a JDBC thin driver connection. You have to use OCI, otherwise the performance will be really bad, see succeeding blog post MemOptimized RowStore in Oracle Database 18c with OCI. This might be a bug. [added on 2018-06-19]. If all conditions are met, then the row is fetched without a single logical I/O. In all other cases you get either an error message or the query is executed the conventional way, using at least 3 logical I/Os (1 I/O for the root index block, 1 I/O for the index leaf block, 1 I/O for the table block). Existing applications do not need to change their code to use the MemOptimized RowStore (beside some DDL). There are 65 wait events in v$statname for the MemOptimized RowStore. You find some descriptions in the Database Reference as well. Key-value lookups then bypass the SQL execution layer and execute directly in the data access layer via an in-memory hash index. Before we can use the MemOptimized RowStore we have to set the size of the memoptimized pool. In this case I set the minimum size and restart the database. Now the database has reserved 75 megabyte for the memoptimize buffer area and 25 megabyte for the hash index. Let’s create an empty table t4 with an memoptimize_read_clause. Please note, that the primary key definition on line 4 is required to avoid an ORA-62142: MEMOPTIMIZE FOR READ feature requires NOT DEFERRABLE PRIMARY KEY constraint on the table. And without the clause on line 6 we’d get an ORA-62156: MEMOPTIMIZE FOR READ feature not allowed on segment with deferred storage. I use the following anonymous PL/SQL block to populate the table t4 with 100,000 rows and gather table statistics. We may now run a query in a SQL client. I’ve used SQLcl because of the comprehensive statistics when using autotrace. The output is the result of the second execution. The execution plan on line 20 and 21 shows the intention to use the MemOptimized RowStore (READ OPTIM). But the 3 consistent gets on line 41 indicate that a conventional index access has been used. We get the proof on line 48 and 49. There was an access to the hash index (1 memopt r lookups), but no key with the value 42 has been found (1 memopt r misses). Hence the fallback to the conventional unique index access. The following anonymous PL/SQL block populates the memoptimized pool for table t4. 100,000 rows are now in the memoptimized pool. Let’s query table t4 again. As before, the execution plan on line 20 and 21 shows the intention to use the MemOptimized RowStore (READ OPTIM). But in this case there are no consistent gets. And on line 38 we have a successful hash index lookup (1 memopt r hits). A SQL query without logical I/Os, made possible by the MemOptimized RowStore. This is very similar to table t4. The storage_clauses on line 6 and 7 ensure that the table and index blocks are stored in the KEEP buffer pool. This will reduce the physical I/Os when querying the table. Accessing a single row requires 3 consistent gets as shown below. An index-organized table stores all its data within the index structure. This reduces the logical I/Os by one when accessing a single row via primary key. We also use the KEEP buffer pool to minimize physical I/Os. Accessing a single row requires 2 consistent gets as shown below. The HASHKEYS parameter (see line 3) defines the number of target buckets for the hash function. In this case I chose 100,000. Without hash collisions every key would be stored in an own bucket. But with this dataset there are up to 5 keys which get stored in the same target bucket. The SIZE parameter (see line 2) defines the number of bytes initially reserved for a target bucket of a hash function. Since I know that there are up to 5 rows within a bucket and I want a bucket to be stored completely in a single block, I chose a size large enough for 5 rows. This lead to 256 bytes, so that I can store 32 buckets in a single 8K block. With these parameters a cluster with 3,125 blocks will be created. It is probably a bit more. How much is depending on the extent management configuration of the tablespace. This is optimal for our use case. But it is not optimal for full table scans, since we use 6-7 times more blocks than needed for a heap-organized table. Accessing a single row in a correctly sized single-table hash cluster requires just 1 consistent get as shown below. If you size the single-table hash cluster incorrectly, for example, by using SIZE 64 HASHKEYS 500 you end up with more than 150 consistent gets to access a single row resulting in bad performance. Sizing a single-table hash cluster is really the key for best performance. However, for mixed workloads (PK access and other accesses to retrieve many rows) sizing becomes challenging and leads to a compromise. In such scenarios a heap-organized or index-organized table is easier to apply and may even be the better option. 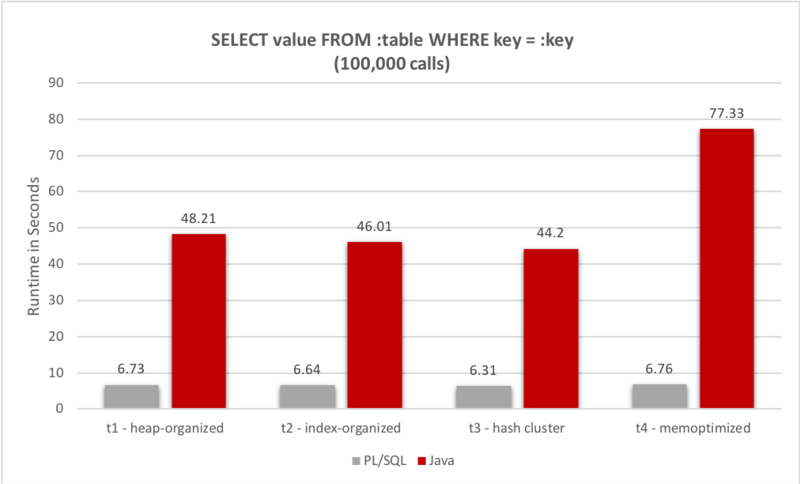 Now let’s compare these four options using a PL/SQL and a Java program reading the table fully via 100,000 queries. Not a smart way to do it, but it should show the performance impact of the different data structures. Both programs are doing the same work. They get a table name as parameter and retrieve every row in the table via primary key access. The PL/SQL procedure runs within the database and the Java program outside of the database. The Java program needs to do 100,000 network round trips. For the PL/SQL program these are just context switches between the PL/SQL and SQL engine. Therefore, the PL/SQL procedure calls are expected to be faster than the Java program executions. Each program has been called five times for every table. The slowest and the fastest runtimes have been ignored. The average of the remaining three runtimes are used for the following chart. The results look plausible for “t1 – heap-organized”, “t2 – index-organized” and “t3 – hash cluster”. But the runtimes for “t4 – memoptimized” are strange. For PL/SQL and Java. This requires further analysis. Let’s execute the PL/SQL procedure in a fresh session again. read 100000 rows from t4 in 6.72 seconds. Line 21 is interesting. 300,025 consistent gets. These are 300,000 more than expected. And there are no values for the wait events memopt r lookups and memopt r hits. This means Oracle uses a conventional access path instead of the MemOptimized RowStore. It’s the same execution plan as for “t1 – heap-organized” and the execution times are similar as well. As mentioned in the Concept chapter in the beginning, the MemOptimized RowStore cannot be used from PL/SQL. See the highlighted lines 12 and 25. We are back to a conventional access path as soon as we enable SQL trace. The runtime is similar to “t1 – heap-organized” plus some SQL trace overhead. SQL trace is a dead end. Let’s try flame graphs. Luca Canali wrote an excellent blog post about flame graphs for Oracle. I’ve followed Luca’s instructions to produce some flame graphs. The PNGs are shown below. You may open the SVG variant via link in a new browser tab. The average runtime of “t4 – memoptimized” was 77.33 seconds and the average runtime of “t1 – heap-organized” was 48.21 seconds. That’s a difference of about 30 seconds. How can we find the functions in “t4 – memoptimized” which are contributing the most to this difference? Third, we are looking for functions on a reasonable level in the call stack. In this case it is not helpful to state that the opitsk function is slower in “t4 – memoptimized”. Reasonable means, that the identified function are sampled in different call stacks. This is avoiding double counting. The following table lists 6 functions that account for more than two thirds of the total runtime of “t4 -memoptimized”. In total, they consume 36.66 seconds more than in “t1 – heap-organized”. In the tab pane above, there are flame graph variants named “marked”, highlighting these functions. Someone with access to the source code of these functions could dig deeper, but I can’t. So I have to stop here. I don’t know how much my unsupported environment contributes to this bad performance. I just can hope it is a lot. Updated on 2018-06-19: After some research I found the root cause. OCI is a prerequisite for getting good performance out of the MemOptimized RowStore. The succeeding blog post gives you more details about that. If you access Oracle Databases with #NoPlsql applications, the MemOptimized RowStore might be an interesting feature to improve the performance when querying single rows from single tables via primary key. If you access Oracle Databases with #SmartDB applications, you cannot use this feature, since it does not work when the SQL query is called from PL/SQL. That’s sad. However, it is disturbing that activating SQL trace or setting STATISTICS_LEVEL = 'ALL' deactivates the MemOptimized RowStore. I hope this will be fixed in a future release. Updated on 2018-06-19, added OCI as prerequisite and link to succeeding blog post.